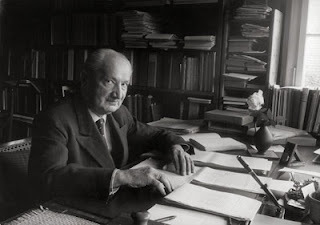 Our last post tried to touch upon the seynsgechichtlich meaning of a statement that Heidegger first makes in his well-known 1929 address Was ist Metaphysik?. Roughly, the statement runs as follows: Being and Nothing are indeed not identical, yet they are the same. In the immediate context of this assertion as it is found in Was ist Metaphysik? there is passing reference made to that thinker with whom Heidegger seems, from his dissertation of 1915 to his last public lecture of 1962, to find the most vigorous point of contention, namely Hegel. And this is no accident. It hardly seems an exaggeration to say there are, at bottom, two ways of hearing this statement, and depending on this alone you are either Hegelian or Heideggerian. Being and Nothing are indeed not identical, yet they are the same. Everything is concentrated in what is meant by the negativity of this "not" --it is the fulcrum on which the meaning of the sentence swings. What possibility is harbored in this non-identity, such that it can allow Heidegger to speak in accord with Hegel against Hegel? In what follows I will permit myself some rough notes seeking to indicate an answer. The non-identity of Being and Nothing could, for Hegel, be explained as the dialectical necessity that Being and Nothing, as prior moments of the Concept of Becoming, remain distinct moments. This distinction of identity must be maintained because otherwise Being and Nothing would, as it were, already be becoming; they would negate the very need for a development, they would negate the possibility of the Concept of Becoming --and along with this negation also the very possibility of their ever being the same in and as this Concept. Conversely, the sameness of Being and Nothing consists in that sublation which alone would preserve and ensure with unshakable necessity their non-identity. As it resounds in Hegel's ear, then, the statement "Being and Nothing are indeed not identical, yet they are the same" is a statement stressing the tension between the non-identity of what is dialectically undeveloped with the sublative, reconciliatory sameness in which dialectical development results. The savory paradox of this statement that can only be lost sight of at the expense of its entire meaning is that the union of the sameness of which it speaks not only reconciles but necessitates the (previous) non-identity of Being and Nothing. In short, "the same" names an "identity-in-difference" which justifies the difference between Being and Nothing just as it is presupposed (in kernel form, as it were) by this difference. But if this statement about Being and Nothing can be made to speak the language of dialectic, how can it speak differently? How does it resound in the famous "ear of Heidegger"? For Heidegger the negativity of this non-identity must be understood in light of two extreme possibilities. The first of these, the first negativity, is that of Das Nichts. As I tried to emphasize in the last post, we are not 'done' thinking this Nothing when we think it as that which, though a constant companion of beings as a whole as such, rarely discloses itself in the welling up of anxiety. Not only through the various stimmungen of Dasein's Befindlichkeit but far more primordially through the historical grantings of Being does the Nothing nichtet: the Nothing is the epocally destined granting of refusal which enables Being as Gestell. Thus we may say that Nothing, thought Beyng-historically, is the consummate withdrawal of Being (Sein). Because it is consummate, this withdrawal (which is in truth the source of history's epochality) itself withdraws into complete concealment; the ages come to an end. It is this negativity of the ending of the epochs of Being, which Heidegger elsewhere calls simply "oblivion", which marks the essence of the Nothing, In interpretting our statement then, the question of Heideggerian non-identity is a question of how this negativity differs from Being (Seyn) itself. But this question also contains another, namely, what negativity is at work in this difference. If the Nothing is to be thought of in terms of a consummate withdrawal of Being, then a fortiori Being must be thought of in terms of a withdrawal, namely, its own (eigen). The first negativity has its secret wellspring in an other negativity. Being is that which is not, nor could ever be, a being, it is that which differentiates itself from all beings, it is that which withdraws from beings --indeed, withdraws from them so that they can be beings for a while (jeweilen). This means that neither Being nor Nothing is to be thought save in this withdrawal. Nothing must be thought in the withdrawal of Being; Being must be thought in the withdrawal of It Itself, i.e. Ereignis. Only according to this withdrawal of Being itself (Seyn) is it possible and necessary that the non-identity of Being and Nothing be maintained --a terrible and overburdening task of maintenance to which our essence has been fatefully assigned, as is revealed in the present age of technology. Interpreting the statement now, the non-identity of Being and Nothing belongs to the non-identity of Being itself. This non-identity proves to be too excessive to offer the stability of a stage upon which to prop the sublation of dialectic. If for Hegel, the sameness of Being and Nothing is in dialectical tension with their non-identity, things are even more paradoxical for Heidegger: the non-identity of Being itself, a negativity which we now understand as withdrawal, marks that separation between Being as such and Being itself whereby the negativity of the Nothing is made possible. The non-identity of Being is the source of its sameness with Nothing. That will take some living with to integrate. I have assumed "as such" and "itself" were synonyms. Your formulation is another "one hand clapping." I cannot begin to guess where it might lead. I see where it might unfortunately come off as a daunting as an impenetrable adage, but I think it is a distinction that ultimately is both intelligible and truly crucial to any understanding of what the later Heidegger means by Being as Ereignis and Das Selbe. But here's the key: you're right! Being as such and Being itself ARE synonymous, if the condition for being synonymous is that your are speaking about THE SAME. But the reason why we nevertheless maintain a non-identity is this: Being SENDS itself (a feat quite impossible for a being). Because it sends itself, it opens a difference in it itself. Thus Heidegger is very 'technical' about his use of "as such" and "itself". The former refers to Being insofar as it has come to light (i.e.has been sent and has therefore constituted an age). However, the latter (Being itself) does not refer to Being as it has been epochally sent but to what is proper or ownmost to Being, namely, and that is the manner in which it withholds (epoche) itself in constituting an epoch, or in other words the "it" that gives in "es gibt Sein". Both terms (Being as such and Being itself), however, refer to the Same, even though not the identical. Again, seems coherent to me and offers the best terms I have yet heard for the Ur picture. My congratulations.